The NASA probe OSIRIS-REx has reached the asteroid Bennu after a two year journey. After traveling for more than two years NASA’s Origins, Spectral Interpretation, Resource Identification, Security-Regolith Explorer (OSIRIS-REx) spacecraft has arrived that Bennu, an asteroid scientist believe could one day hit earth. OSIRIS-REx has traversed over two billion kilometers to reach Bennu which it will spend a year studying. 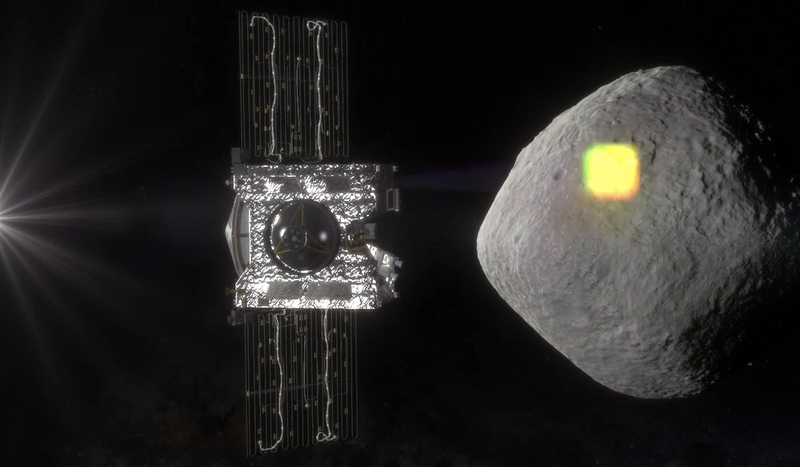 There are five scientific instruments on OSIRIS-REx that will assist it in achieving its goals, in particular, the spacecraft is expected to locate an area of the asteroid suitable to take a sample from. It will return the sample to earth in 2023 for analysis by NASA scientists. The spacecraft won’t land on the asteroid but will use a mechanical arm to reach out and gather up around 60g of asteroid material. The spacecraft is expected to parachute chute back to earth over Utah. If successful, the sample will be the biggest collection of space rock on earth since the heyday of space exploration in the 60s and 70s. NASA hopes the samples will help them learn more about water content in the solar system as well as data about organic molecules. Bennu is pretty small, thought to be roughly 500 metres across. Researchers will have more information about the asteroid from the spacecraft soon and present the updated details at a scientific meeting on Monday next week in Washington. OSIRIS-REx is the size of a large family car and will hover around the asteroid for a year before it makes its attempt at collecting the samples. NASA isn’t the only space agency keen to get its hands on materials from space. A Japanese spacecraft has been documenting another close-to-Earth asteroid called Ryugu since June. It is Japan's second asteroid mission. NASA have had a huge month. Kicking off with the successful landing of the Mars InSight spacecraft on the surface of the red planet. InSight will probe Mars’ surface sending back information back that could solve long-held questions about the planet’s water stores. The agency backed the InSight success with the historic announcement of commercial partners for future moon missions. Under the Space-1 Directive NASA is pursuing new manned missions to the moon. Unlike previously internally funded missions, the agency will now partner with external companies in a ‘pay-for-service’ model.